Mold is a menacing bio-contaminate that can do some serious damage to your Wenonah, NJ property and put you and your family at risk of the potential side effects of mold exposure. Certain species of mold can release mycotoxins that are potentially toxic to humans. Additionally, the water source feeding the mold growth means serious water damage that can severely diminish the structural integrity of the building. Bottomline, a mold contamination and the water source promoting the mold need to be immediately addressed to avoid most costly repairs down the line. If you are detecting signs of a mold contamination in your home or business, you should consider hiring a certified professional to conduct a mold inspection property. A comprehensive mold inspection in Wenonah, NJ, conducted by a certified professional, will determine if you have mold, how bad it is, how to properly get rid of it and how to prevent it from returning. The MasterTech Team has taken time and care to establish a thorough noninvasive mold inspection process. This process allows our inspectors to gather as much information as possible about your specific mold case, while limiting unnecessary damage to your Wenonah, NJ property. When dealing with mold growth, it is vital to approach with caution, as to reduce risks of cross contamination and potentially worsening the problem. Visual Inspection: Your inspector will be searching for conditions that promote fungal activity. All findings will be digitally documented through photographs. This makes relaying information simple, and you will have visual documentation throughout the whole process for your records. Moisture Mapping: Moisture is the key ingredient to mold growth. Diagnosing the water source that is allowing for the mold growth is an integral part of a mold inspection. Taking time to isolate all damp areas and understanding where the water starts and stops will help to understand how to avoid repeat problems in the future. In more severe cases, complete water damage restoration of your Wenonah, NJ home may be necessary prior to mold remediation. Our inspectors use moisture meters can read and determine the moisture content of building materials. Even if something appears to be dry at the surface, there could be residual moisture absorbed within building materials that promote mold buildup. Thermal imaging completed with infrared cameras will allow your inspector to detect temperature differences. Wet building materials are almost always cooler than dry materials. Thermal imaging will help to determine the starting point of the moisture source and how extensive the water damage can be. Mold Testing: Surface and/or air quality tests will provide scientific support determining if there is a mold concern. In cases where there are no visual signs of fungal activity, air quality testing will determine if there is abnormal mold spore counts in the air you breathe. Report of Findings: Once the inspection is completed, the samples will be sent off to a third party lab and testing. Along with your test results, your inspector will provide you with an easy to read, detailed report of findings based on all the discoveries from the inspection. 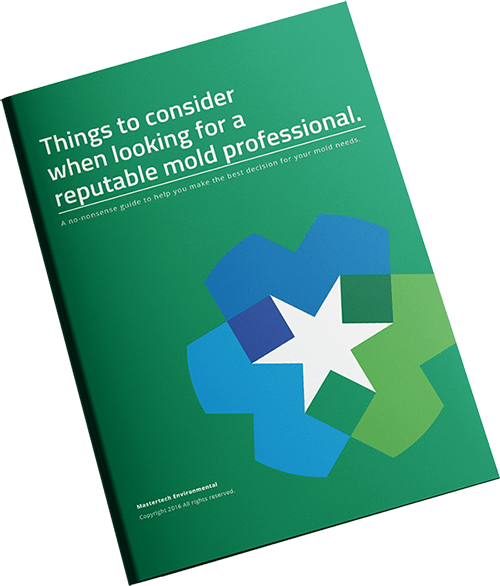 Scope of Work: If necessary/requested, your mold inspector will craft a mold remediation plan specific to your mold needs. Each scope of work will outline cleanup suggestions in addition to preventive measures that will be required to ensure that the mold does not return. 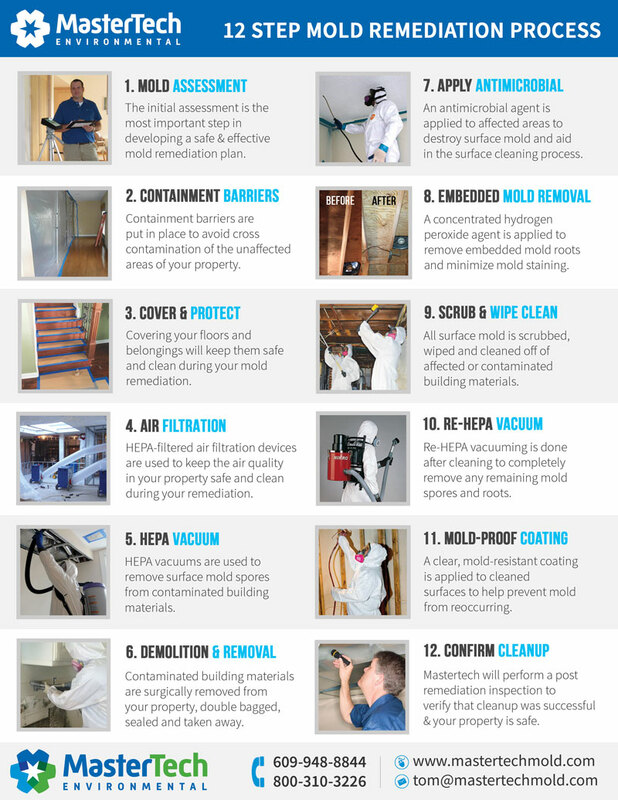 When it comes to mold, a poorly executed mold remediation can have serious implications for you, your family, and your property. That is why, at MasterTech, getting the job done right the first time is not merely our goal– it is our standard. Every step of our Gloucester County, NJ Mold Removal process is strategically put into place to ensure the safest and most effect mold remediation in Wenonah, NJ from start to finish. Each MasterTech mold remediation is backed by a 5-year mold-free warranty. It is our promise to you and your family that the mold has been safely and effectively removed, and it will not come back. Wenonah, NJ home and business owners often worry that the building will be blasted with a harsh and dangerous chemicals during a mold remediation. No one wants to live in or work in a chemically treated environment. MasterTech has taken all possible measures to ensure you and your family will be returning to a mold-free AND safe environment. For mold removal Wenonah, NJ, we use the safest methods available in the industry today. Our team of experts is constantly researching newly developed mold removal methods, to ensure that our process stays the safest, most effective, and most efficient. A major mold contamination should be addressed immediately to avoid further and costlier damages. If you detect a mold problem in your New Jersey home or business, call MasterTech today to schedule a Gloucester County, NJ mold inspection. For mold inspections and mold removal in Franklin, NJ or mold inspections and mold removal in Newfield, NJ, call 1-800-310-3226!